Four thousand, three hundred and sixty. 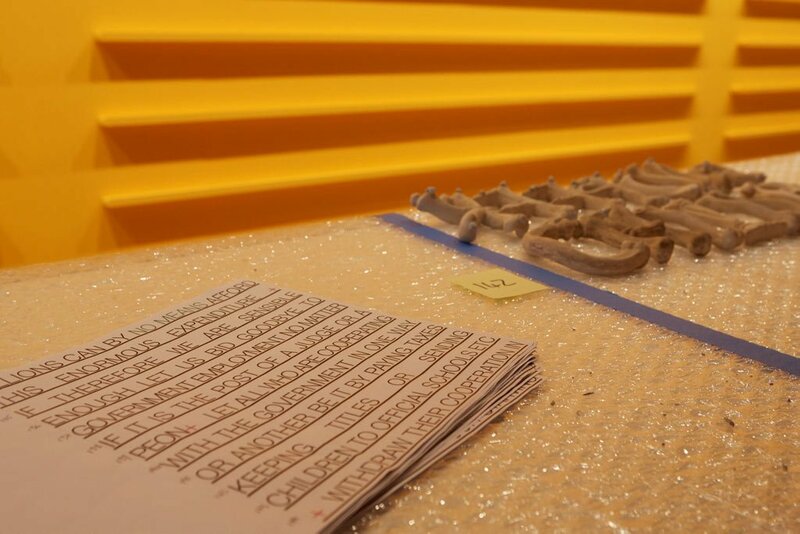 That’s how many bone-like letters – each about 15 centimetres high – we’ve installed in the Gallery’s entrance court in the last two weeks or so for Public notice 2 , an installation by Indian artist Jitish Kallat. 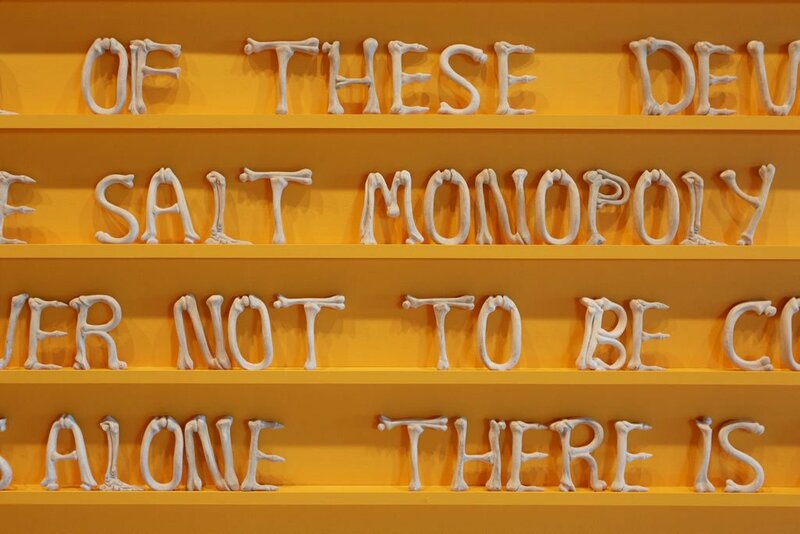 The letters spell out a speech delivered by Mahatma Gandhi on the eve of the 1930 Salt March, a landmark event in the Indian independence movement. Planning for the realisation of this work – now on display as part of Go East: The Gene & Brian Sherman Contemporary Asian Art Collection – started several months ago and drew on the expertise of staff across the Gallery. The Conservation Department did a series of tests to find the most suitable method of securing the letters. We needed an adhesive that was conservation safe, reversible and didn’t leave any residue or by-product on the letters, while also being tacky enough to hold the letters securely to the wall. Once that was identified and sourced, thousands of sticky dots had to be produced by our conservators in preparation for the installation. At the same time, the design team was charged with the task of measuring up two walls, dividing them into ‘pages’, then determining the layout of the words on each line of the page. The text needed to fit perfectly into the space, and the designers were able to produce a detailed plan that specified how each individual line would look. This meant our installation could start on any line at all, in any order. The alignment of the text is justified, so that the right and left edges of each text block are straight. Words were specially spaced to ensure their meaning is understood, and larger spaces between words indicate the start of new sentences. 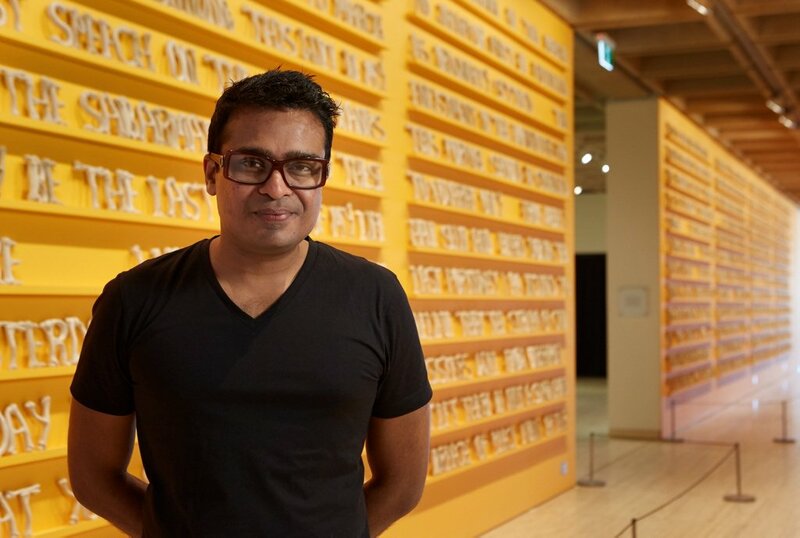 Printouts of the layout were finessed by the exhibition curators, Jitish’s studio and the Shermans to ensure the work was displayed as originally intended and could be read easily by Gallery visitors. It was important to Jitish that the text of the speech remain true to the original words of Gandhi, so grammatical errors and any inadvertent misuse of the language have been retained, although punctuation is not included. 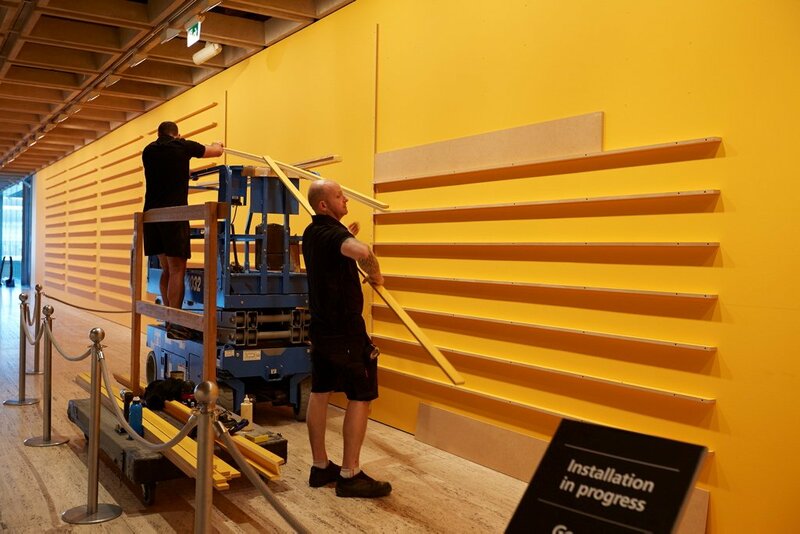 Once the layout was finalised, the workshop constructed small shelves designed to ensure the letters would not fall, and the paint shop set to work mixing a specific tone of yellow selected in consultation with the artist. 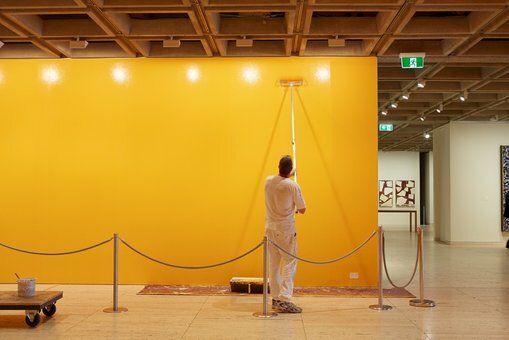 The preparation of the exhibition space took several weeks, with work having to be done during opening hours – an additional challenge for those involved. A week before we started installing, a team of curatorial, conservation, registration, installation and exhibition management staff met to work out the best plan. 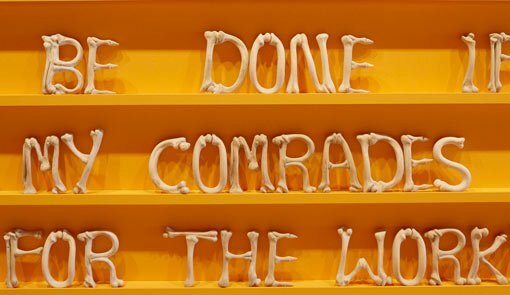 We’d received the artwork in several large crates, individually packed with boxes full of bubble-wrapped letters, which look like bone but are, in fact, made from polyester resin with a filler (some have a wire within). We decided that the best approach would be to open all the crates, sort the letters into alphabetical order, then pull out the individual letters, word by word, line by line, and place these into boxes that were easily transported to the entrance court. We covered portable tables in bubble wrap to provide a soft surface for the letters and set up these each day in front of the section of wall on which we were working. 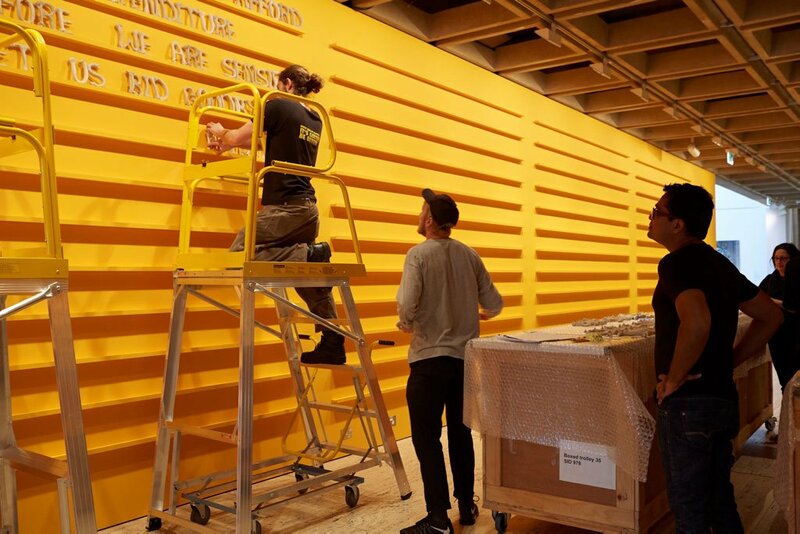 Each letter was unpacked one by one and placed in line, adhesive was applied, then the letter was handed to a member of the installation crew, who secured it to the wall. The shelves had been marked out to help with the spacing. Two crew members worked in unison, starting at different ends of a line and meeting in the middle, to further ensure the right positioning was achieved. 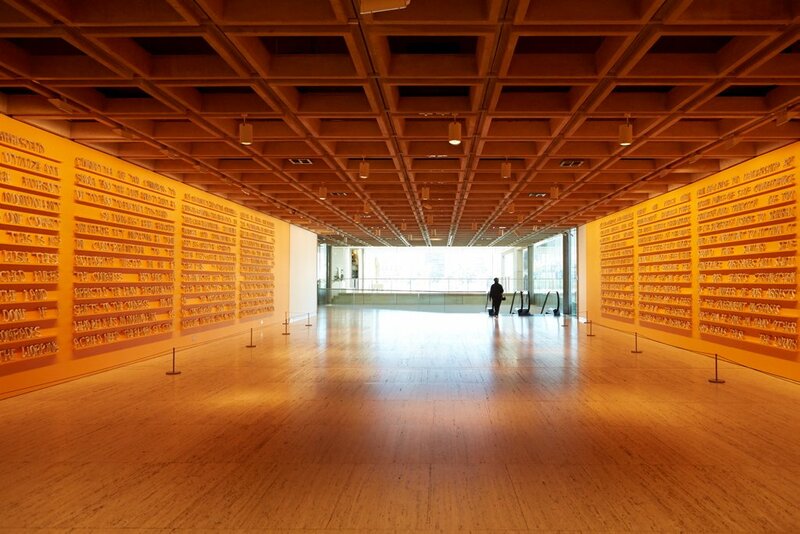 Richard Cabral, a member of Jitish Kallat’s studio team, flew into Sydney from Mumbai to assist with the installation. He was in charge of quality control, checking each letter was placed in the correct orientation and the work looked as it should. Richard was in constant email communication with Jitish to make sure the artist was also happy with the finished product, and Jitish himself joined us in the final stage. Though the initial pace was slow, we developed a rhythm in the first couple of days that saw us able to install two pages a day and complete the work before the official opening on 14 May. You can see a slideshow of this mammoth team effort, by clicking on one of the small images below. The 'sunshine yellow’ wall colour for Public notice 2 was mixed by our paint team in consultation with the artist Jitish Kallat. The workshop built small shelves on the walls, on which the letters sit. Letters were unpacked and placed in word order, and small dots of adhesive applied. Layouts showed exactly how the letters were to fit into the space. 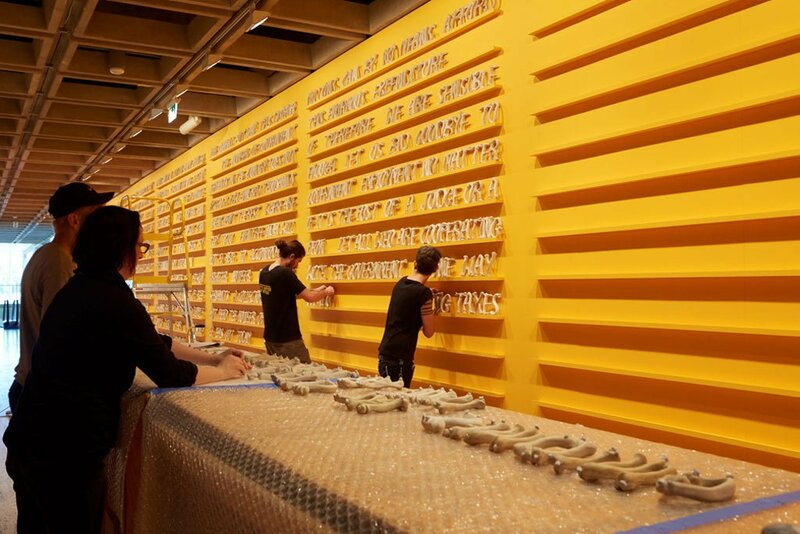 The installation crew installed the speech, letter by letter. Two crew members worked in unison, starting at different ends of a line and meeting in the middle so that the right spacing was achieved. Words were specially spaced to ensure their meaning is understood. Larger spaces left between words indicate the start of new sentences. Artist Jittish Kallat (at right) was on hand to supervise the final stages of installation. Artist Jittish Kallat in front of Public notice 2 . It is the first time he has seen the work realised in its entirety. Public notice 2 installed on two long walls in the Gallery’s entrance court.